Duval County, Florida contracts its residential trash collection services to select waste haulers. The city works with several different waste haulers, all of which you are free to choose from. You can see the current list here, or call (904) 630-2489 to find an approved waste hauler in your area. You are free to order junk removal services from any licensed junk removal company. To dispose of any waste other than construction and demolition (C&D) debris and recyclables, you are free to hire any licensed junk removal company you please. You must choose a franchised waste hauler to dispose of all other materials. Disposing of more than 40 pounds of construction/building debris requires hiring a rubbish removal company. The city doesn’t allow more than 40 pounds, or more than 1 cubic yard of construction debris or building materials, to be disposed of in household trash. From a single truck load to multiple truck loads, we load, haul, and clean up the junk from your residence or business. Our service reps will remove anything from anywhere. Whether your items are in your basement, garage or backyard – All you need to do is point! Our service reps will remove your materials quickly so you can reclaim space and get on with your day. Once all your items are loaded, we sweep and make sure your area is clean and haul your junk off. We do all the work and we recycle. Our waste management services are environmentally friendly and we are a GoGreen certified company. Let us take the stress and hassle out of your clean-up jobs. We provide quality roll off dumpsters for quick and easy clean up. ArwoodJunk.com takes pride in using qualified local providers to handle any remodel or clean up project you may need. 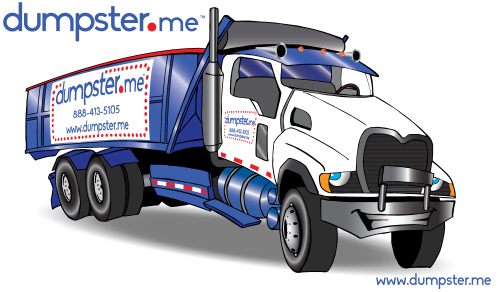 Your dumpster will be delivered directly to your home or project site. All at an affordable price! With over 25 years of experience, we're here to help. * Actual dumpster sizes may vary per market area. 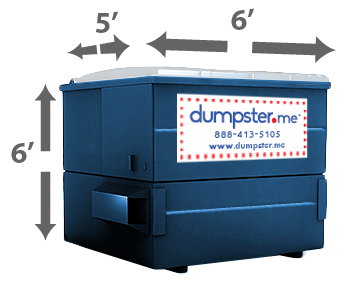 We provide quality commercial dumpsters for your business. ArwoodJunk.com takes pride in using qualified local providers to handle any level of service you require. Regardless of your needs, we've got a solution. 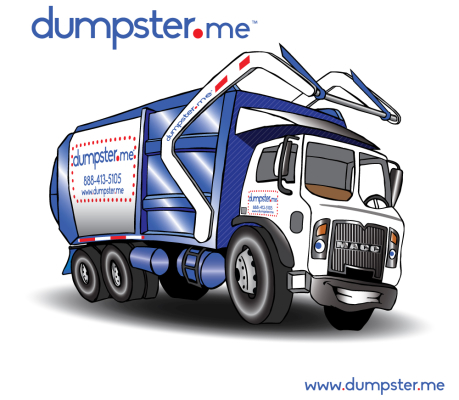 Your dumpster will be delivered directly to your business - All at an affordable, clear up-front price! With over 25 years of experience, we're here to help. The “Notorious AW Potty” is Happy & Clean! We provide a broad range of demolition services including total and selective demolition as well as plant dismantling and massive clean-up. From a garage or mobile home demolition, to a kitchen remodel or a driveway removal, to excavating services, environmental removal, swimming pool removal, or demolishing entire houses, strip malls, or industrial parks, no job is too large or small. We have the personnel, experience and equipment to ensure a safe and complete demolition for any commercial, residential or industrial demolition job. We listen to your specific needs and use specialized equipment to deliver safe and cost effective demolition services. Our up-to-date equipment gives you the most precise and safe demolition. We strive to minimize potential hazards both during the demolition and once the debris is removed. We also use state of the art recycling services for a wide array of materials. We recycle as much debris as possible including concrete, brick, wood, ferrous and non-ferrous materials. Choose from our large selection of portable storage solutions. Residential Storage Units are the convenient solution for moving, renovating, decluttering, and cleanup and recovery storage. We'll deliver your portable unit then pick it up and move or store it when you're ready. Storage facilities are climate controlled and have 24 hour security and surveillance. Mobile Office Rental combination units offer the perfect solution when you need both storage and office space. All steel construction and security features make these units great for portable classrooms, construction trailers, administrative or sales offices and special events. We deliver and set up your portable office on your site. If you need to relocate the unit, our friendly crew is available to handle the move for you. Hi, I'm Danny the Dumpster! Technically, I'm a roll off dumpster truck but I know a lot about all kinds of dumpsters. My friends are always asking me questions about dumpsters and dumpster rentals. I decided to take the best and most common questions I hear and give you the answers. Danny, what is the difference between a commercial and a roll off dumpster? Well, the size and function are the primary differences between the two types of dumpsters. Commercial dumpsters can be used to dispose of regular waste (MSW), recyclables and organic wastes which include green (yard) waste and food waste. 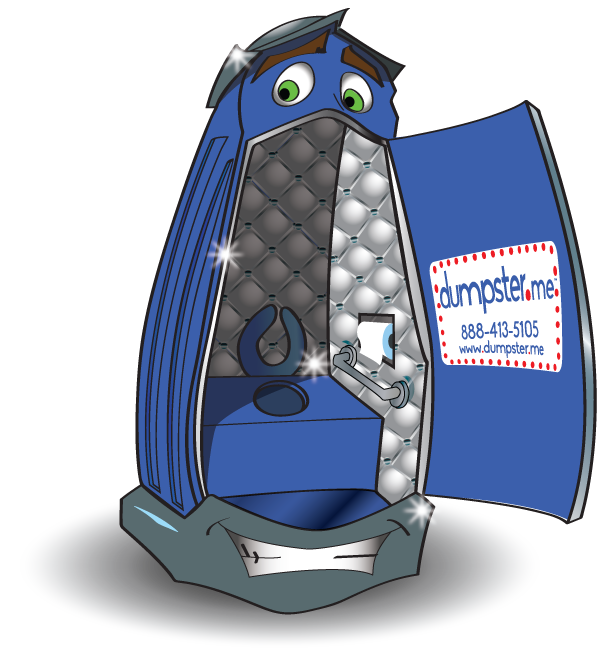 Commercial dumpsters are smaller, ranging from a 2 cubic yard to a 6 cubic yard dumpster. These are the dumpsters you typically see behind a business complex, gas station, restaurant, apartment complex, or other businesses that need permanent scheduled services. Such services are almost always scheduled anywhere from once every other week to seven days per week. Roll off dumpsters, on the other hand, are larger and generally hold anywhere between 10 cubic yards and 40 cubic yards of waste. They are generally used for temporary needs such as a home remodel project, garage clean out and construction related projects such as building and demolition of roads, homes and office spaces. Roll offs get their name because they “roll off” the back of a truck when delivered to customers. We have pictures and dimensions of all roll off and commercial dumpsters available to help you with what you need. I've got a project coming up. 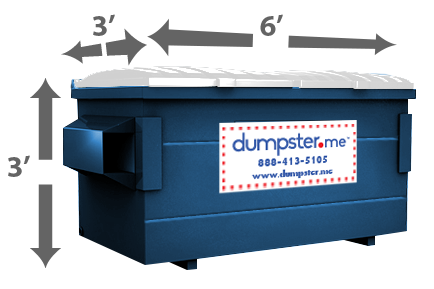 How do I determine which dumpster size is best for me? Great question! If you're a business owner and you seek scheduled weekly services on a permanent ongoing basis then you need to schedule commercial dumpster services. If you are seeking dumpster services on a temporary basis for a clean out, home remodel, construction project or any other temporary project, then a roll off dumpster is the correct choice. 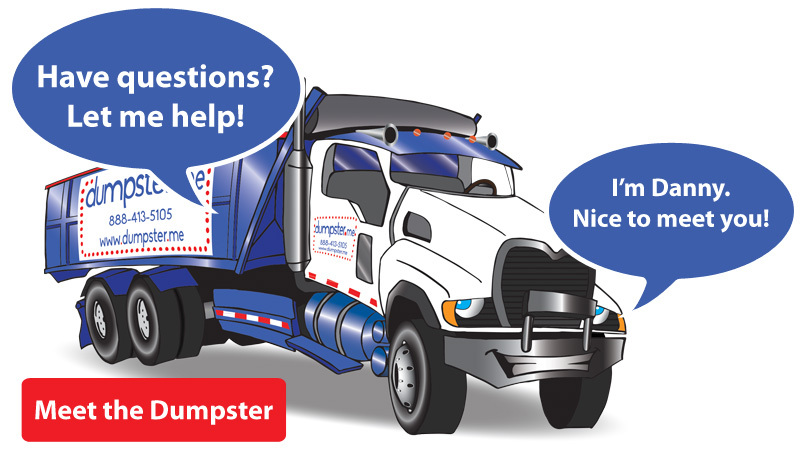 Ensuring you select the correct dumpster size for your project can save you time and money. A dumpster that is too small will cost you more by requiring you to schedule additional hauls to remove all of the debris while a dumpster that is too large will cause you to incur initial unnecessary expenses if a smaller one would have been enough. Please see our dumpster dimensions and sizes to help you select the best dumpster for your needs. Please note that each cubic yard will hold roughly 15 (thirteen gallon) kitchen-sized trash bags or about 6 (thirty gallon) large trash bags. How do I order a permanent commercial dumpster? 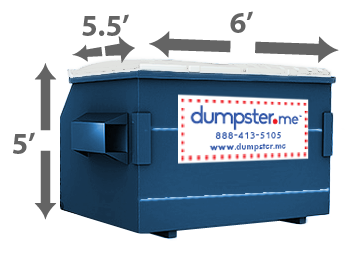 To order a permanent commercial dumpster, simply select the appropriate commercial dumpster size and complete the requested information. A ArwoodJunk.com customer service representative will contact you to complete your order. How do I order a temporary roll off dumpster? 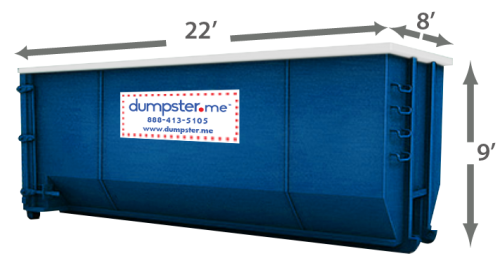 To order a temporary roll off dumpster, simply select the appropriate roll off dumpster size and give us a call. How much space is required for the dumpster? 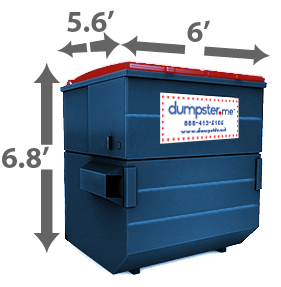 You will find dumpster dimensions listed on this site for each dumpster type. It is recommended that you provide space to accommodate double the amount of the width and height of the dumpster to assure adequate height and space clearance. Also consider an additional 10’ for the door that swings open at the back of the dumpster. I'm worried about my driveway, Danny. Will a roll off dumpster damage my driveway or pavement? A full roll off dumpster can be very heavy depending on its size and the type of materials that are placed inside the container. Thus, we highly recommend customers take any necessary actions to prevent any potential damage to driveways and pavements by placing a 4’ x 8’ sheet of plywood on the driveway where the container will be placed. The customer affirms that any right-of-way provided by customer (disclosed in delivery questions) for the roll off container is sufficient to bear the weight of all contractors’ dumpster equipment and vehicles required to perform the contracted service. The customer assumes all liabilities for damages to private driving surfaces, pavement or road surfaces and entire roll off container placement site. ArwoodJunk.com and its affiliates shall not be responsible for any damages to any private driving surface, pavement or accompanying subsurface of any route associated to perform the service that was contracted. Can the dumpster be placed on the street? Permits may be required. Please check with your local municipality for specific rules and regulations. Danny, I have a lot of different things. What items are not allowed to be placed inside the dumpster? Hazardous waste, dirt, industrial waste, chemical products, radioactive material, oil filters, herbicides & pesticides, solvents, paint (except completely dried latex paint cans, no liquids), other flammable liquids, aerosol cans, propane tanks, motor oil, transmission oil/lubricating/hydraulic oil/oil filters, contaminated oils (mixed with solvents, gasoline, etc. ), antifreeze, petroleum contaminated soil/lead paint chips, tires, appliances, fluorescent tubes, batteries, computers, monitors, televisions, microwaves, railroad ties, medical waste, asbestos, animals, barrels and all liquids. Material must be level at the top of the container; nothing can be sticking out of the top. Additional requirements may apply based upon locality. The liability for appropriate waste remains with the customer as agreed to in the terms and conditions when contracting with ArwoodJunk.com and it's affiliates. Is it necessary for someone to be on location when the dumpster is delivered or removed? What if I need an extra haul? It looks like we've got more waste than we originally thought. You can have additional hauls with your order. Additional charges will apply. Wow, this garbage is really heavy, Danny! Will I be billed for extra weight? Yes, if your tonnage goes over the included tons quoted in your initial order you will be charged additional costs, as terms and conditions apply. To ensure we can provide you with exactly what you need, we request that you contact them at least 2 days in advance of your event. For large events or highly populated job sites, a week or more lead time is encouraged. However, if you require same day delivery, we can often accommodate you. Most city ordinances specifically detail the requirements regarding portable sanitation on construction sites. Generally, inspectors require that a portable toilet is ordered and on site before approving the inspection. Additionally, OSHA requires a portable toilet on a construction site, as listed under the Safety and Health Regulations for a Construction Site (1923.51 (c) (1), 1926.51 (c) (3), (I), (ii), (iii), (iv)). For information regarding specific city or country ordinances contact us. Contact us as soon as possible to report the incident. They will then dispatch a driver to come to the site and make the necessary adjustments. We offer portable wheelchair restrooms that are ADA compliant for use on your construction site or special event. ADA units are large enough and obtain the proper elements to meet the standards that have been outlined by the Americans with Disabilities Act. We will place your units at your event or job site per your instruction. They will make every reasonable attempt to accommodate your desire for specific placement on the unit. However, we will relocate the unit and notify you if it becomes necessary, so that we may service the unit safely. We have highly trained employees that will not only pump out the holding tank, but will clean the inner bowl of the unit and provide thorough janitorial service inside and out of the unit. They clean and sanitize the portable restrooms at each service, as well as provide a special sanitizing detergent in the water that also acts as a deodorizer to keep the unit smelling pleasant while reducing your exposure to germs. We are dedicated to reliable and responsible junk removal and disposal. We always aim to meet or exceed expectations and it's this philosophy that drives us to not only follow applicable environmental requirements but to go beyond them and seek creative ways to reduce, reuse and recycle wherever we can. We pride ourselves on being accountable to the community by emphasizing environmental stewardship and corporate social responsibility. We support recycling education efforts like The Recycle Guide that provide information and resources for our communities. Between recycling and donations, we keep as much as 80% of your junk out of landfills. Much of the materials we haul can be donated and reused, so we make sure to identify and donate any reusable furniture, electronics, clothing and home wares to local charities whenever possible. Even salvageable construction debris is donated to Habitat for Humanity. We feel it's important to take care of our community, and one of the ways we do that is by making sure nothing goes to waste. Our socially responsible practices ensure your old junk is put to good use and kept out of landfills whenever possible. Recycling your junk matters! We make every effort to recycle items that cannot be salvaged and reused. Some of the materials we recycle include paper, electronics, metals, glass, concrete, construction debris, drywall and furniture. When items are dismantled for recycling, components that contain hazardous materials are removed and disposed of separately. By recycling your junk, we help save natural resources, reduce harvesting of new materials, prevent harmful chemicals from being released into the environment and reduce the growth of landfills. When items cannot be reused or recycled, we make sure they are disposed of properly. Many junk items contain chemicals such as lead, cadmium, and mercury that can be harmful to health and the environment if not disposed of properly. These chemicals are released into air and water when they are crushed in landfills and should never go in your regular household garbage. We take safe disposal of these harmful materials very seriously, which is why we meet all regulatory requirements, often adopting our own higher standards to protect the environment.